I got this amazing idea from Bruno Reddy, @MrReddyMaths. Go and read his post here. I love his discussion about mean and deciding who should win! When I saw his post I knew it would be fun. I planned on using the data to calculate mean, median, and mode. However, I did not realize how much mileage I would get out of this one activity! I pretty much teach the entire data chapter using just the data from this one activity. 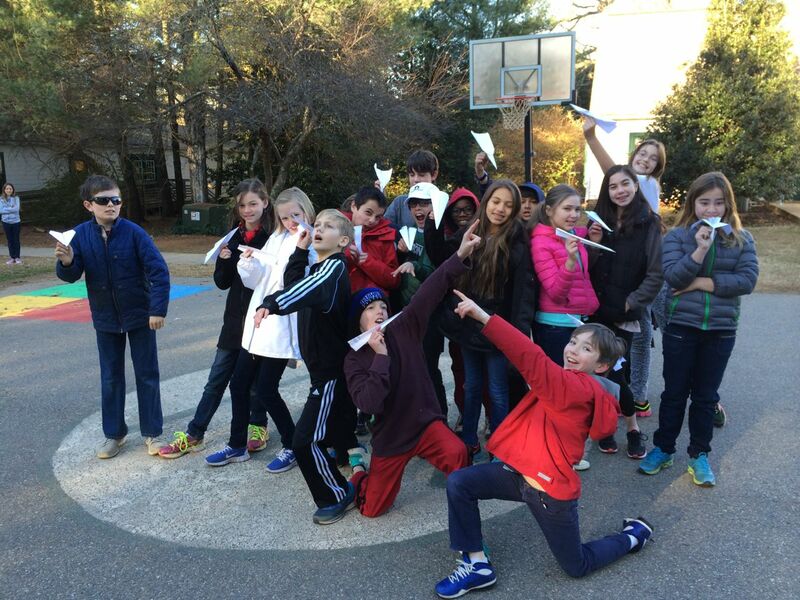 I have my students watch the “How to Make a Paper Airplane” video and give them the template. I do not give them any instructions and do not allow them to help each other. Following directions is always a skill I am trying to teach 6th graders. After we make the airplanes, we get to fly them! Of course, I make it a competition. And of course, I video it! Everyone gets a partner, to help with measuring, and three attempts at the best flight! Student’s whose planes fly backward get to record NEGATIVE flights. 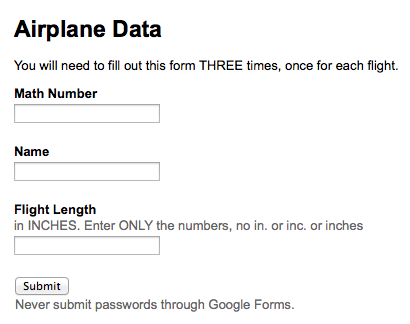 All three flights are recorded and then entered into a Google Form. For homework that night, they had to find the mean of their three flights. I have students make a line plot out of all three entries. This year, I only had 21 students, so this is 63 entries. This is a great time to talk about scale. I have them record their distances in inches, but then they quickly realize that it is a much better idea to make the line plot using feet. We find the mean, median, and mode of our data using our line plot. Range is one of my favorites here, especially with the inclusion of the negative flights. This year, our flights ranged from about -300″ to 600″. Predictably, almost all students told me that the range was 300″. Students love plugging values into formulas incorrectly. To help correct this misunderstanding, I had my -300″ flight student and my 600″ flight student come to the front of the room. I stood at the starting point (the edge of the blacktop for us, also known as 0) and had them stand where their respective planes had landed. Students immediately not only saw that 300″ was way off, but they saw why. This was a wonderful opportunity to show them that 600 – (-300) was indeed 900″, not 300″. My analogy to help deepen understanding was, “You leave from Charlotte to fly to New York, but you have a layover in Atlanta first”! Nothing is ever better than visual learning and real life examples. The next day we learned about box plots. I project the line plot of our flight data and as a class we make it into a box plot. They loved seeing that a box plot can helpfully catagorize their data. Outliers are visual here, as well as where 50% of their flights landed. Next year I am going to take a picture of their airplanes laying on the blacktop to back this statistic up visually. 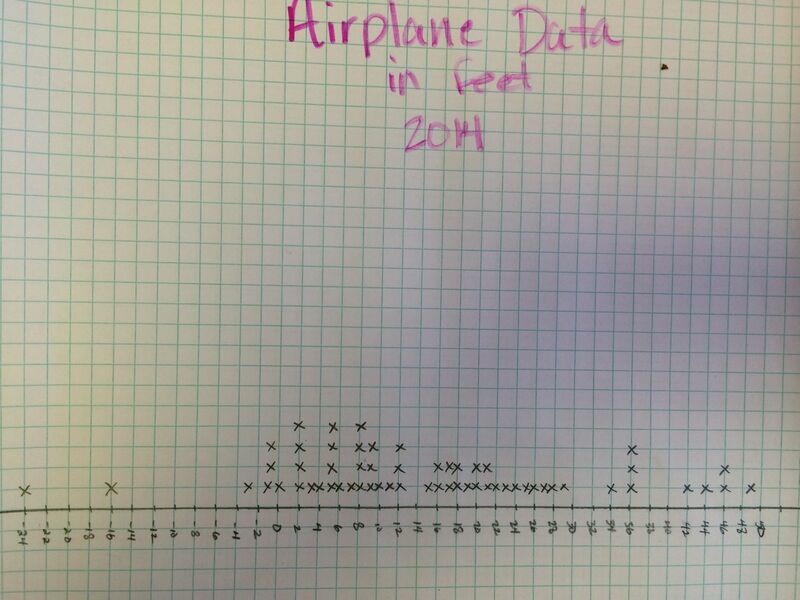 I also had the students create a box plot of their mean flight data. They wrote their mean flight length (in feet) on a sheet of 8×11.5 paper. Then, they organized themselves into a human box and whiskers plot. The students who were the lower and upper extremes, Q1, Q3, and median all held index cards with the name on them. We also decided who was in our interquartile range. I shared the data with the students and we then all made bar graphs and histograms on Google Spreadsheets. The students like the histograms better as it condensed the data into groups. They also learned how to sort the data and find the mean using a formula. Again, they love finding the mean using spreadsheet formulas, find it less “mean” than calculating it by hand, and call me a “mean” teacher for not showing them this in the first place! Practice makes perfect. I emphasized that there are 5 syllables so you need 5 points. I had the students hold up their fists and then count off with their fingers while saying, Box and Whis-kers Plot over and over, and over. After going over vocabulary and doing some easy examples, I had the students access their own measurement data located in our Google Spreadsheet. My students always care more (and remember more) about anything if it has something to do with them. We have two sections of 6th grade. For homework I assigned the students to make TWO box and whiskers, one for each section of the class. The next day in class I put students plots up on the Elmo to compare the heights of each class. They love showcasing their work and comparing the two sections. We then did a kinesthetic activity by making a human box and whiskers plot. 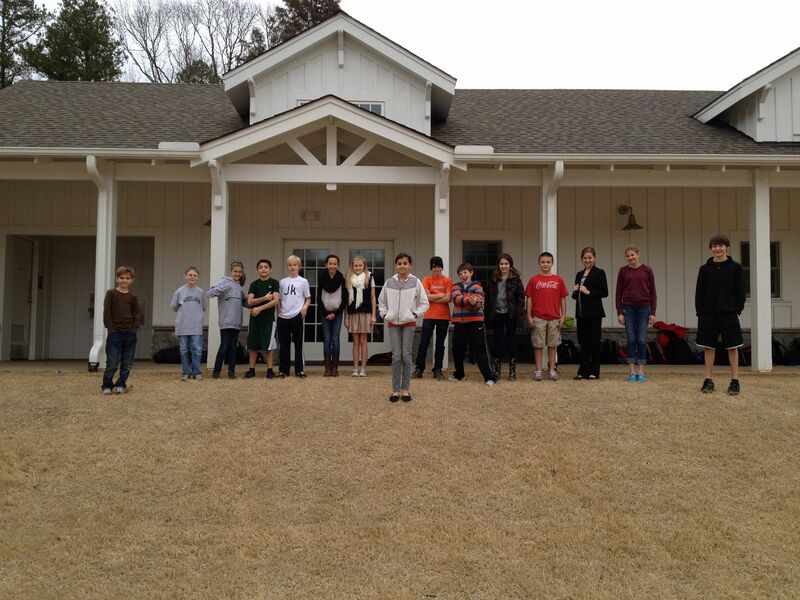 I had all of the students line up from shortest to tallest. I asked then what points we plotted first (extremes) and had those student step forward. Then, we found the median and had that student step forward. 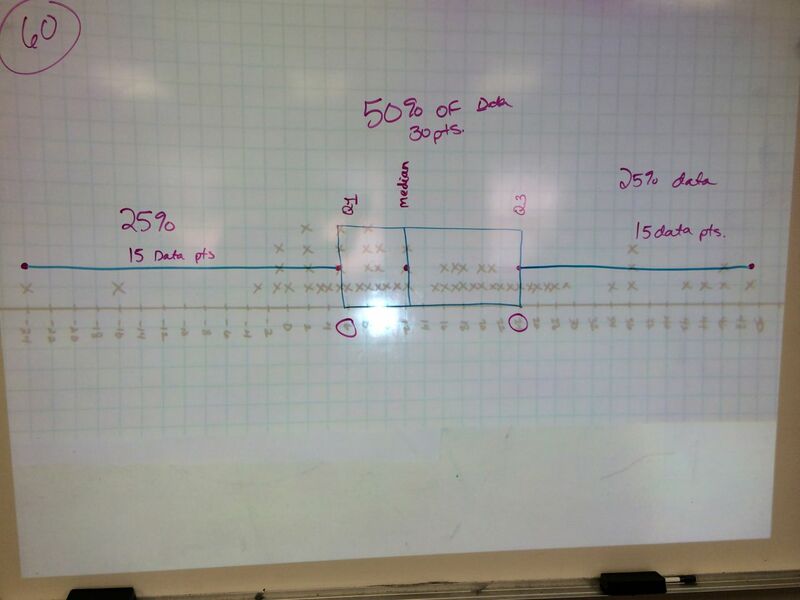 I asked the shorter end, “Who are you?” and they yelled, “The lower set of data!” and then we found the lower quartile and had that student step forward. I did the same thing with the upper quartile. In one class the numbers worked out and we did not have to average any two students to find the quartiles. In the other class, it did not, so we had two students stand in a line. We joked that we added them up and split them into two. (“I’ll stand on your head. No, you can stand on my head!”) It was fun! Students enjoyed the human box and whiskers plot. They got to move around plus it was very visual. With the numbers taken out, I feel like some students really understood what was going on instead of just marking off numbers looking for the median. Next year… I am going to use something (yarn maybe?) so we can actually “box” the students into their quartiles and make the whiskers. I could also cut out construction paper “dots” for the students who step forward to hold. This would also be a cute instructional iMovie starring the students.